Encouraging your pet cobra to bite you was perhaps not an auspicious way to end an inter-colonial journey. Yet when Victorian manure merchant John Burstall arrived in Melbourne in 1867, he did just that. Having purchased the serpent in Ceylon (now Sri Lanka), Burstall cheerfully displayed it to fellow guests at Tankard’s Temperance Hotel. Confident of having wrenched out the cobra’s poison fangs, his chief response after being bitten several times was to smoke a pipe. Within hours, however, Burstall was discovered writhing in agony and emitting a “peculiar sound … something between a low whine and a moan”, at first thought to be a dog’s keening. Despite urgent medical treatment, his vomiting and copious diarrhoea soon progressed to an incoherent stupor. Burstall expired later the same day. 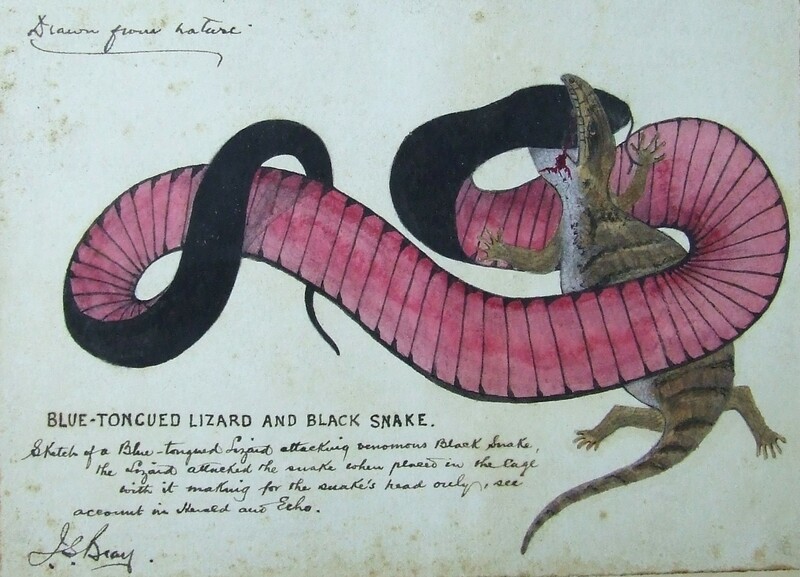 While thousands died each year after cobra bites in India, Burstall’s demise caused a media and medical sensation in colonial Melbourne. 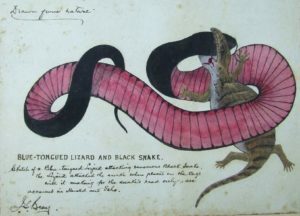 It also prompted the city’s sole Professor of Medicine, George Halford, to experiment with the venom of the slayed cobra. After microscopical examination of the enigmatic fluid, Halford injected a quantity into a dog, which “died after the usual symptoms”. Expanding his investigation to include another dog, a kitten, a pigeon and a rat, he also tested the venom of the Australian black snake. Halford rapidly developed a theory that venom was alive with serpentine “germinal matter”, which hybridised with the victim’s cells to drain them of their “animal power”. Indeed, ventured Professor Halford, perhaps the dried venom of innumerable dead cobras had blown into the atmosphere from India, creating a widespread epidemic of the dreaded diarrhoeal disease, cholera. Such events and conjectures all made perfect sense in mid-nineteenth century Australia. 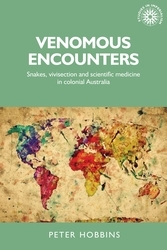 As detailed in my new MUP monograph, Venomous encounters, venom connected an array of colonial sites, practitioners and practices. Its composition and actions – indeed, its very ontological essence – continued to be disputed by naturalists, biologists and doctors into the fin de siècle. The nature of venom mattered, moreover, because it directly affected the moral status of animals. While the first European invaders on Australian shores considered the local snakes innocuous, what altered their opinion was not human testimony, but animal suffering. Specifically, the early settlers observed a consistent snakebite syndrome across diverse species of valuable imported creatures, from dogs and cats to sheep, cattle and horses. As colonial surveyor William Govett exclaimed in 1836, “how must this horror be redoubled to witness the effects of the venom upon a human being!”. The implications were manifold. As Venomous encounters argues, from the 1840s both lay and professional pundits regularly experimented with snake venom in animal subjects. In short, the Australian colonies were alive with vivisectors. Furthermore, through often-acrimonious exchanges with practitioners in the United States, Raj India and French Indo-China, they debated not only the fundamental nature of venom, but the place of vivisection within the epistemology of ‘scientific medicine’. In striking contrast with anti-vivisectionist sentiment in late-Victorian Britain, however, the ethical implications rarely bothered colonial practitioners. Snakes were frequently deemed ‘venomous’ or ‘deadly’ on often-tenuous evidence, and were exterminated accordingly. Moreover, the moral status of other beasts – such as Halford’s dogs, kitten, pigeon and rat – diminished precisely because their sacrifice was deemed essential in procuring an effective antidote to snakebite. In this way, venom tainted more than merely snakes: its global circulation flowed into the very form and practices of modern biomedicine. Venomous encounters is available now!